I specifically did not plan much this summer. I wanted to relax. Ha - the joke is on me. It seems each week is filled with some sort of adventure. We have gone to the zoo, had eye appointments, visited the library, had a birthday party or two, gone to a friend's house or two, and just run errands. Nothing seems to ever really slow down. Recently, I had to change out the children's clothes, and clean out their room. Now the living room is piled with clothes and toys in various containers. I am still working through all of it. Fortunately, I still try to make time to do a few other things, like read and knit. I have finally gotten the Milkrun Shawl back to where it was before I started over. I didn't intend to do this, but I did just start the book 1776 in audio book form last week. Ironic, but appropriate. I have new glasses (picture soon, I promise!) and I think I have a priority list for projects. 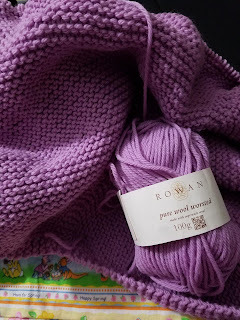 I will finish the Milkrun shawl, then finish the Cosy Stripe afghan, and then do Little Man's Dragon. I hope that will end in August, and then I can finish my V-Neck Boxy, Little Man's afghan, and maybe start on the Princess's afghan. I also need to work on the 2 unicorns for the girls. I have Jane's Ubiquitous Shawl in the wings, as well as Fading Point. All I need is time, right?